Styles and titles by which the Emperor Bahadur Shah addressed the Agent of the Governor-General attached to His Majesty's court. bl.uk > Online Gallery Home	> Online exhibitions	> Asia, Pacific and Africa Collections	> Styles and titles by which the Emperor Bahadur Shah addressed the Agent of the Governor-General attached to His Majesty's court. 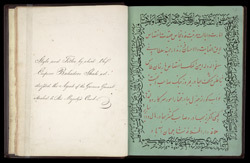 Style and titles by which the Emperor Bahadoor Shah addressed the Agent of the Governor-General attached to His Majesty’s court.